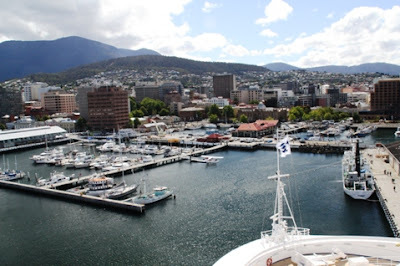 ﻿﻿When our cruise ship docked in Hobart, the capital of Tasmania and second oldest capital in Australia, we entered a deep water harbor nestled between Mt. Wellingotn, Mt. Nelson, and the Derwent River. 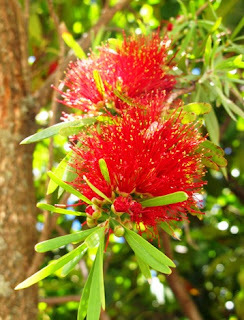 Once connected to the Australian mainland, land masses drifted as sea levels rose around 10,000 years ago, and an island about the size of West Virginia was formed. Located just four kilometers from Victoria, Australia, Tasmania is composed of the main island and 300 offshore islands. There’s a water view from almost everywhere on the island; no spot is more than 90 miles from the ocean. Thousands of lakes, even inland (some manmade for hydroelectric power and others natural from glaciers), are scattered throughout Tasmania, adding to its reputation as an excellent place for outdoor adventure. Because getting to the island is made difficult by the Southern Ocean, Bass Strait, and Tasman Sea (known for its rough passage), the Aboriginal people living on the island were separated from European settlers who arrived on the mainland in the early 19th century. In 1803 a small party of soldiers and convicts, under command of Lt. John Bowen, was dispatched from Sydney, Australia to establish a penal colony—a legacy that many people still associate with Tasmania. Originally, the town was located on the eastern bank of the Derwent River (warmer and drier than the western section), but eventually it moved to Sullivan’s Cove on the western shore, which is the current center of Hobart’s waterfront area. Fortunately, Tasmania sits on the Austral-Asia Plate, which makes it stable and free from earthquakes. We’re surprised to learn that Tasmania is closer to the equator than to the South Pole. 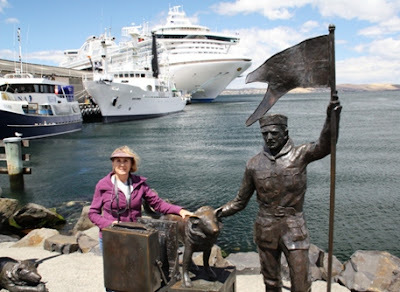 Tasmania is easy to explore on foot, although we covered a significant part of the island in one day on a bus . Visitors have many activity choices such as the Tahune Airwalk; whitewater rafting on Franklin, Huon, and Picton Rivers; and surfing big waves. Cheese farms in the north; vineyards in lush green valleys; and tranquil forests entice visitors to explore the island’s topography that ranges from coastal to mountainous. Seals, penquins, and quirky Tasmanian devils (found in the wild only on this island) are examples of various wildlife found on the island. Going through Hobart, we passed the Royal Tasmanian Botanical Gardens and crossed the Derwent River on a bridge opened in 1965 but destroyed in 1975. An additional bridge, Bowen Bridge was built later. 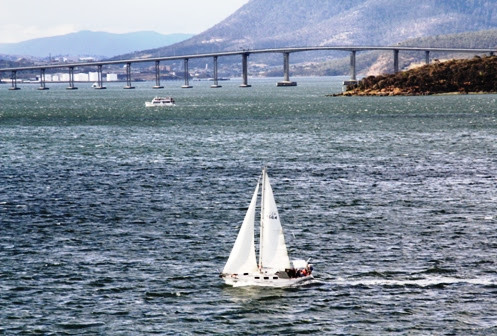 At Rosny Point we enjoyed spectacular overviews of the city and harbor. 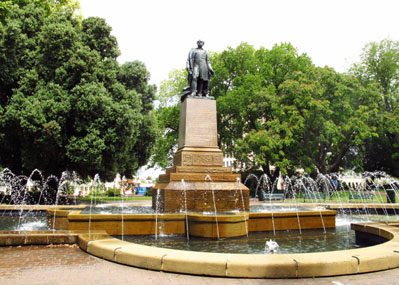 Later, Larry and I walked around Hobart admiring the inviting square, well-preserved historical buildings, monuments, and cottages that are still in use, primarily for government services. Another attraction (we didn’t indulge) is the first legal casino in Australia. Tasmania has much to attract visitors, and I’ll tell more about our excursion there in another post.